Today’s defence-related news includes further reporting on legacy issues in Northern Ireland. The Daily Express and The Herald both carry separate stories about legacy issues in Northern Ireland. It is only due to the courageous efforts of our security forces that we have the relative peace and stability that Northern Ireland enjoys today. We are now considering how best to improve the current system and ensure that there is no unfair and disproportionate focus on former members of the Armed Forces. The welfare of our personnel and veterans is of the utmost importance and we provide legal and pastoral support to any veteran who requires it. 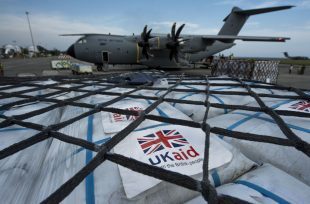 UK and Indonesian Aid is loaded onto an RAF A400M aircraft in Jakarta, Indonesia, bound for Balikpapan.